.... Fog instills the air with a sense of secrecy through its “swirling” presence and weighty gloom. It was a terrifying world where women walked the streets and abandoned children huddled in doorways. It was a place, in the late 1880s, where Jack the Ripper roamed and slaughtered with impunity. Look out this window, Watson. See how the figures loom up, are dimly seen, and then blend once more into the cloud-bank. 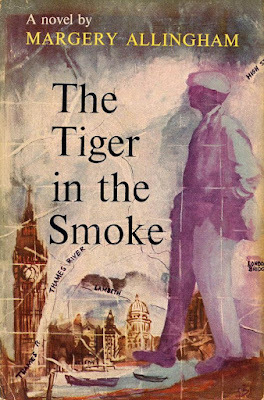 The thief or the murderer could roam London on such a day as the tiger does the jungle, unseen until he pounces and then evident only to his victim. These thick and dangerous fogs lasted right up to the middle of the last century. One of the worst and deadliest occurred in December, 1952. .... The fog was like a saffron blanket soaked in ice-water. It had hung over London all day and at last was beginning to descend. The sky was yellow as a duster and the rest was a granular black, over-printed in grey and lightened by occasional slivers of bright fish colour as a policeman turned in his wet cape. Already the traffic was at an irritable crawl. By dusk it would be stationary. To the west the Park dripped wretchedly and to the north the great railway terminus slammed and banged and exploded hollowly about its affairs. Between lay winding miles of butter-coloured stucco in every conceivable state of repair.